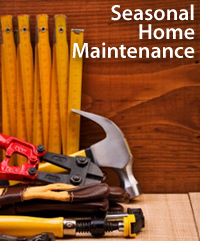 As a constant series of chores, home maintenance is a four-season job and one which should not be taken lightly. The tasks of each season are unique and November’s jobs are mostly preparatory in advance of colder weather. If your routine maintenance uncovers larger issues including a faulty HVAC unit or a leaking faucet, for example, seek professional help to make the repair. The calendar has turned to November; the month during which we transition from fall into winter. With less sunlight, colder temperatures, and shorter days ahead for Michigan, it’s an opportune time to cross those last-minute maintenance items off your homeowner to-do list. Practicing preventive care — both inside and outside your home — can save thousands of dollars in repairs come later this winter. What follows is a brief checklist to get you started. Inspect exterior lights and outlets. Be sure that none of the outlets are cracked or broken, or have exposed wires. Clean gutters and clear all blockages. If leaves are falling, redo after leaves are off all trees. Inspect and test outdoor railings and stairs. Have problem trees trimmed, including those that may damage your home in a storm? Protect outdoor water faucets from freezing. Consider using foam cups, sold at hardware stores. Change batteries in all smoke detectors and carbon monoxide alarms, whether they are “dead” or not. Vacuum refrigerator condenser coils, plus the front bottom grill. Empty and clean the drip pan. Inspect wood stoves and fireplace inserts. Hire a certified chimney sweeper to clean the chimney, if needed. Insulate bare water pipes running through your home to prevent freezing and to limit condensation on cold-water lines. Inspect automatic garage door opener. Lubricate chains according to manufacturer’s instructions. Make sure bolts and screws are properly tightened and secured. Clear out and vacuum lint from under and behind clothes dryer, inspect the exhaust tubing is cleared.